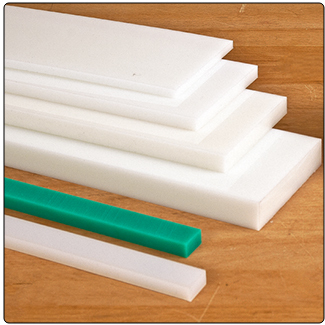 UHMW Polymer (plastic) is a linear polyethylene with a molecular weight in the range of 3,000,000 to 6,000,000. This value represents the "average molecular weight". Therefore UHMW is 10 times heavier than regular high density polyethylene. Use this UHMW to make jigs and fixtures for your table saw , router table, etc. These easy to cut 4'' x 48' 'sheets come in several thickness. Also use the 3/4" x 3/8" plastic strips to make sliding table jigs for your table saw, band saw or router table. Note: All sizes, thickness, length and width are approximate. Sheet sizes may vary slightly from sheet to sheet. Sears strip item #1119 may vary in color. Ultra high molecular weight polyethylene self-adhesive tape is perfect for jigs, drawers, fences and fixtures--wherever you need to make sliding parts slide easily. It's the right way to perfect your Delta table saw tenon jig, or to make that homemade miter fence glide smoothly across your saw. If it needs to slide you can either do something temporary (over & over) or you can use Slick Tape. 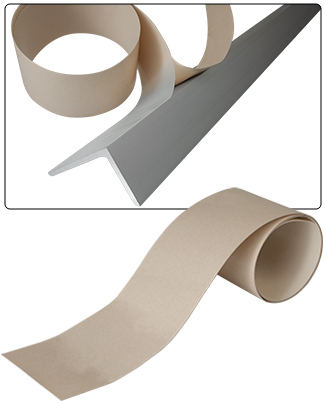 The UHMW Self Adhesive Tape comes in two lengths 36" or 48", both are .015" thick and 3" in width. Note: Aluminum Extrusion not included. The universal stop block is used with the 3/8" x 16 T-Track to create a fence stop block for accurate and repetitive cuts. 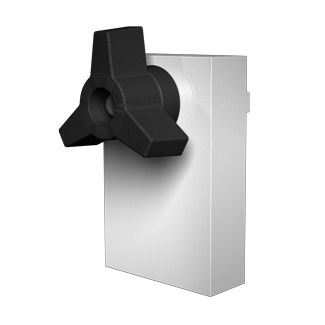 You can lock the UNIVERSAL L SHAPE FENCE STOP BLOCK in place for specific length cuts. Designed for top mounting with Heavy Duty T-track. The perfect stop for all your jigs and fences. Made of UHMW and comes with a 1/4" hex head bolt and knob to work with Mini-T-Track. The stop is sized to fit the Fence Backer Boards . Note: Includes only 1 ea. per purchase. MDF Fence not included. 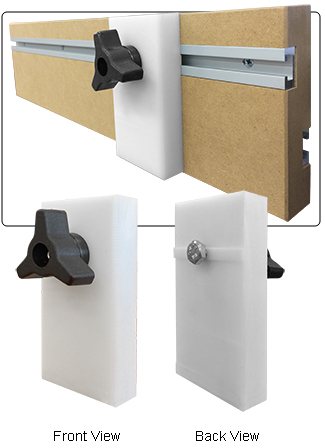 The UNI-T-Fence Stop Block is designed for top UNI-T-Fence or for 1/4" x 20 T-Track to create a fence stop block for accurate and repetitive cuts. You can lock the UNI-T-Fence Stop Block in place for specific length cuts. 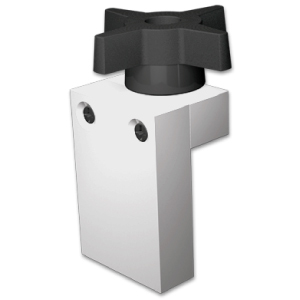 Designed for front mounting with 1/4" x 20 T-Track.